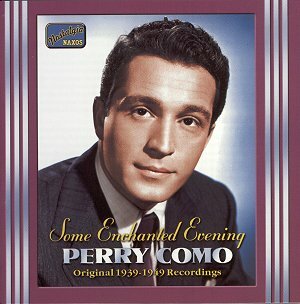 The album features Perry Como singing with various bands, the recordings were made between 1939 and 1949. His laid back easy style of singing was very similar to that of Bing Crosby, perhaps he was even more laid back than Crosby was. It was a distinctive style however and it won him a lot of fans who bought his records and gave his TV show top viewing figures over many years. It is estimated that by the 1980's he had sold in the order of 60 million records. Perry Como was born Pierino Roland Como in Philadelphia, USA in 1912. He started out in life as a barber, but after winning an amateur singing contest, he decided to make his career as a singer. In 1936 he joined bandleader Ted Weems, who he is heard with on track 2 of this album. He had a hit with 'I Wonder Whose Kissing Her Now' in 1939 and by 1943 he had a recording contract with RCAVictor, it lasted 50 years! From then he worked throughout the USA as a solo artist and right up to the1980's, he was a highly paid, world-renowned singer. He clocked up 40 No1 hit records in the USA and although he did not visit the UK until 1975, the tour was a complete sell out. He spent his last 10 years quietly playing golf and fishing at his home in Jupiter, Florida. After a career like his he deserved the rest! Perry Como was a very great entertainer and these recordings which have been very skilfully restored by Peter Dempsey for Naxos, make it possible for us to hear him at his best.